Under the main DPMS window, we have several links to supervisor’s work. I will explain some of the important links in this article. In a C class office, both the PA and Supervisor work can be done in the same window. 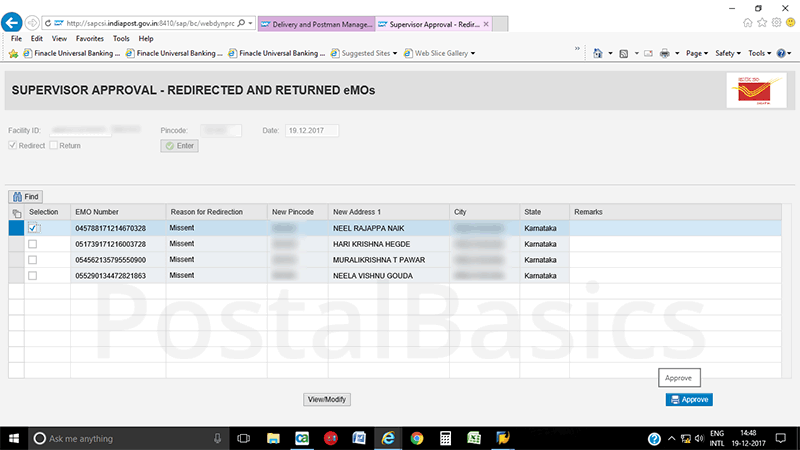 Unlike finacle, in SAP for PA and Supervisor we have the same user ID. Once you have redirected or returned the mis-sent EMOs, the supervisor has to approve it. After the approval, it goes to the respective post office with respect to pin codes. The same procedure is applicable for BOs redirected EMOs as well. Click on the check box for Redirect or Return and click on ENTER button. The redirected EMOs will get listed as shown above. Select the respective EMO and click on Approve. 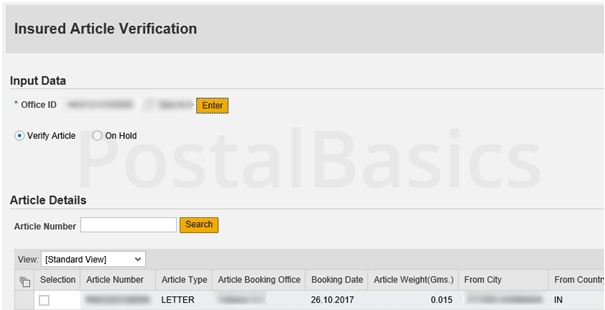 If the article received is insured, it should be verified before invoicing to the postman. So, the supervisor has to verify the article by using this option under Supervisor Approval. Click on Insured Article Verification. You will get the below window. 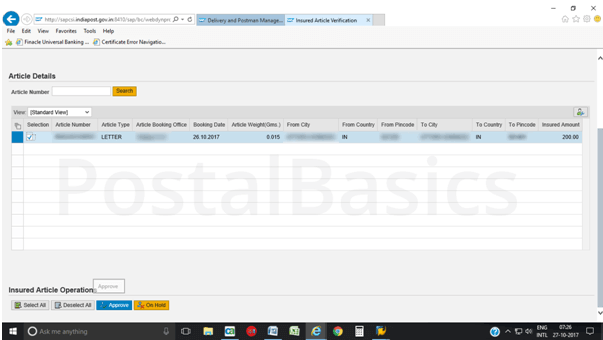 Fill in the office ID and click on Enter button. The insured article will get fetched below as shown in the above screenshot. Select the article and click on Approve as shown below. This method is for the approval of invoiced EMOs. Once you have invoiced the EMOs to all beats, the supervisor has to verify it. This is same as in the old package. Click on the link Supervisor Approval – EMO. The below window will appear. Here you can cross check the amount of invoiced EMOs to the beat. Now, select all and click on Approve button. When an EOD is not performed on a day due to unintended issues(like a network problem), then the next day we can do the EOD of that beat before confirming by using the Delayed Confirmation Approval link. EOD is not performed using EOD Supervisor Confirmation. We have another link in DPMS Transaction and Report.